Just 6% of Rhône Valley wines are white, but there is huge variety of styles, from straightforward, everyday wines to some of the finest, most distinctive whites in the world. Though they share some grape varieties, the white wine in the Southern and Northern Rhône are very different. With some destined for the dinner table and others deliciously drinkable by themselves, there are styles to suit all tastes and plenty of value to be found at every level. We’ll take a close look at the varieties and appellations that make white Rhône an increasingly popular and sought-after category. Find below Matt's top white wine produce selection for the Rhône Valley, classed by appellation. Côtes-du-Rhône: Domaine du Seminaire, Domaine de l’Amandine, Domaine Gramenon, Domaine de Remejeanne. Matt Walls is a freelance wine writer and consultant based in London. He is a contributing editor at Decanter and writes regular articles for other magazines and websites such as Foodism, Imbibe and timatkin.com. He won the Best Newcomer awards at the 2013 Fortnum & Mason Food and Drink Awards for Drink Me, his first book on wine, which has sold over 10,000 copies. He publishes a popular wine blog, www.mattwalls.co.uk, for which he won International Wine & Spirit Competition Blogger of the Year 2015. When not writing, Walls advises restaurants on wine lists, hosts tastings, judges food and wine competitions and develops wine apps. Matt is interested in all areas of wine, but specialises in those of the Rhône – he is Regional Chair for the Rhône at the Decanter World Wine Awards. The Rhône is France’s second largest producer of AOC wines (after Bordeaux). Its viticultural history dates back to the Romans who sculpted its terraced topography and introduced the vine. It is in the Rhône where east meets west. The granite and schist of the Massif Central (west) collide with the sedimentary soils of the Alps and its foothills (east)…. So, how well do you know the Rhône? Christophe Tassan is interviewed by Decanter Magazine’s Andrew Jefford about the Rhône Valley and its wines. “I was born in the dining room, in hospitality,” Christophe tells us, which seems appropriate, as this interview took place in a San Francisco restaurant around the corner from The Battery, where he is currently the wine director. As with all wine regions, there is a list of producers with whom every wine student should be familiar in order to understand the diversity and complexity of the wines produced. In the Rhône, the list is long because there are those known for their traditional winemaking styles and those known for being more modern (if not avant garde!). In this seminar, you’ll meet the rogues and renegades and old guard. British national residing near Gigondas in the Southern Rhône. Born to a French mother (from Provence), Olivier studied Economics at Cambridge University and, having obtained First Class Honours, took the well-trodden route into industry working for Unilever, Time Warner and Linklaters LLP. Olivier's passion for wine took off at Cambridge but a decade later after gaining qualifications with the WSET, Olivier established a part-time boutique UK wine importing business with Jeremy Williams in 1999. Their passion for wine encouraged them to make their own wines in Provence for sale in the UK by sourcing locally-grown fruit. Olivier and his lawyer wife, Janet decided to permanently leave the London rat race in 2003 and move to Provence. Olivier planted his own micro-vineyard in Valréas from which he continues to grow and make small quantities of wine today; but it was his fascination for the French concept of “terroir” that took Olivier on a different route. Whilst French wine culture is routed in “terroir”, the concept is very poorly understood (if at all) by majority of the wine-drinking public. With time on his hands, Olivier embarked on a two year research project interviewing growers and winemakers to get to the root of this elusive concept – what is terroir and how does it really influence wines, wine-growing and wine-making practices? What is truth, what is myth and more interestingly, what do we still not know? Olivier decided that the best way to educate wine consumers was by establishing what was in 2006, the first Rhône-based Wine Tour business www.wine-uncovered.com. 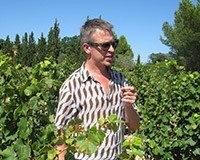 Olivier consulted on inaugural Grenache Symposium in 2010 and provides consultancy services for importers and educational services on behalf of the professional association, Inter Rhône. Chateauneuf-Du-Pape 2016… A Fabulous Vintage ! As autumn is drawing to a close and the wine presses have been washed and put away, the first wines tasted before being blended confirm what had been sensed: 2016 is going to be a fabulous vintage! And if some compare it to the magnificent 2010, some others do not hesitate to go as far as the famous star-vintage 1990… Either way, the evidence that we are witnessing the making of a great vintage is clear.